Most people spend half of their waking hours at work. It’s no wonder that the workplace becomes not only a place of employment, but where socialization takes place, too. As a runner who’s passionate about his sport, Mike Kisak, associate controller for financial reporting at Akron Children’s Hospital, finds himself talking about running and its many benefits to his co-workers in the accounting and finance departments. If the co-worker is considering an exercise program, he’s quick to recommend they try running. At first, participating in organized running events wasn’t on Mike’s bucket list. But when an accounting department colleague invited him to run a 10K race in spring 2003, the charged-up atmosphere and hoopla of race day hooked him. The next opportunity came later the same year. When Mike learned that Children’s wanted to put together a relay team to run in the inaugural Akron Marathon, he raised his hand. Then he enlisted colleagues from accounting and finance to round out his team. One work friend with whom Mike shared running stories was Pat Doherty, a Children’s employee for 39 years. Pat died 2 years ago after a 10-year battle with cancer. According to Mike, the lure of running in the hometown race snagged Pat, and soon he joined an Akron Marathon relay team, later building up to run the half marathon. Over the years, Pat grew into an avid runner. 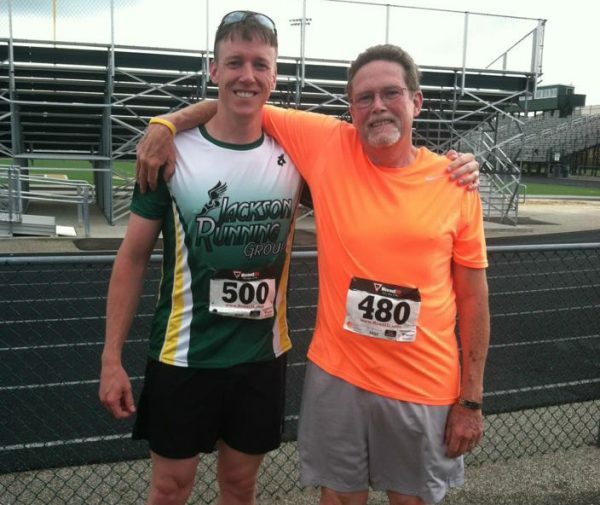 The last race he completed was the 2013 Akron Marathon Half Marathon. “Pat was a very likeable person who always got involved − and inspired others to reach for excellence in their work and fulfillment in their lives,” Mike said. For that reason, Children’s is memorializing Pat’s enthusiasm for his co-workers and running. The hospital’s Employee Challenge includes the first Patrick Doherty Memorial Cup, which will be awarded to the “most engaged” team, composed of a squad leader, employee squad of runners, volunteers, donors and others. 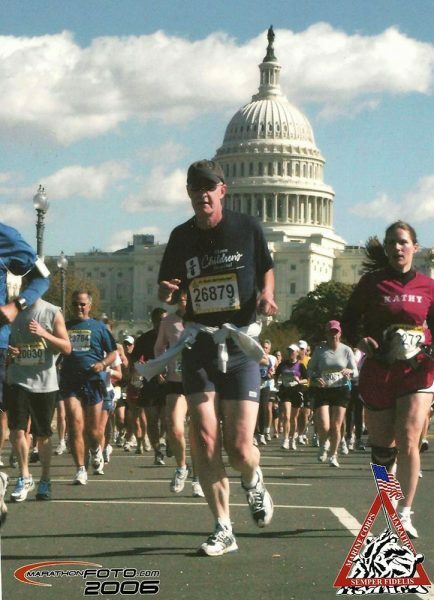 Since 2003, Mike has run 13 marathons around the country and countless half marathons and road races. 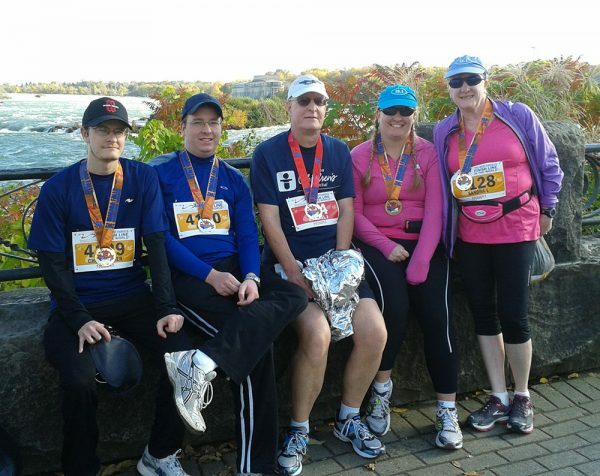 Mike’s enthusiasm spread to his family, who now participates in racing events as walkers. His family likes to make race events a “mini” vacation. They extend the weekend by staying an extra day or two and sightseeing in the cities where they’ve traveled. Mike encourages walkers to consider participating in the marathon, noting that many people race-walk marathons. “From what I’ve seen, many organizers allow this as long as the person is able to walk at a pace that allows them to complete the course in the allotted time,” he said. Mike said he understands the appeal of a race, which is why he keeps coming back. Learn more about the 2016 Akron Children’s Hospital Akron Marathon Race Series. Kudos to Judy for her dedication and perseverance! She is an inspiration!